The Volvo Club of B.C. 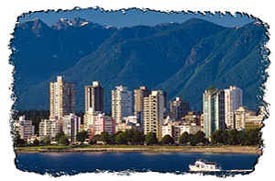 VCBC is hosting the 20th annual VSA West Coast National Meet in combination with the VCOA Pacific Northwest Regional Meet, in Vancouver B.C., August 24-26 2001. This is the first national meet to be held in Canada and it is going to be fun. Make your reservations early and join us for the celebration. Vancouver is the largest and most beautiful city in Western Canada. Perched on the shore of the Pacific Ocean with the Coast Range Mountains as a backdrop, it is an entertaining and welcoming city. From spring to fall, a steady stream of ocean liners start their Alaskan cruises from Vancouver Harbor. Vancouver is also the gateway to the rest of the province. Excellent highways connect to the B.C. interior and some of the most scenic countryside anywhere. B.C. Ferries can take you to Victoria and other destinations on Vancouver Island. The site of the Convention is the Best Western Hotel in Tsawwassen BC. Tsawwassen (the T is silent), is a suburb south of Vancouver and a 2 _ hour drive north from Seattle. It is near the US border, Vancouver airport, and Ferries to Vancouver Island. There are some great drives to and from the meet and we can provide maps of various routes. The hotel (1-800-943-8221) is offering excellent rates of $105 Canadian (approx. US$75) for a suite and $85 (approx. US$60) for a traditional hotel room. With the US dollar worth $1.50 Canadian, it makes it very economical for US visitors. The convention format will be familiar to those who have attended past West Coast Conventions. During the day on Friday there will be a choice of 2 hosted drives. One drive will tour highlights of Vancouver. The second will make an ambitious 200 mile round trip on the scenic "Sea to Sky Highway" to the world famous Whistler Village ski resort. The official kick-off to the event will be a first class welcoming reception and registration on Friday evening. Saturday is car day, with a judged concours for all models, displays by Volvo related companies, technical sessions, and a celebration banquet and awards ceremony. All too soon it will be time for Sunday's farewell breakfast and photo session. The end of the meet certainly doesn't have to be the end of your vacation. There are wonderful tourist destinations in every direction. Come and experience Beautiful British Columbia.